Hazardous substances constitute a special class of toxic agents in that they pose immediate dangers to human health via simple contact or proximity. 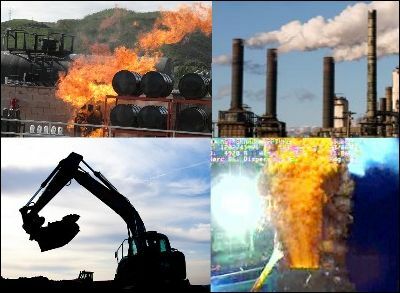 TCAS provides toxicological consulting and assessment services for a wide range of hazardous toxic substances, including environmental hazards, industrial chemicals, hydrocarbons, petroleum products, heavy metals and compounds, dioxins, pesticides and many others. TCAS routinely collects and evaluates site data, compiles geophysical data and historical information, identifies substances present at a site and produces exposure assessments on behalf of clients. Such assessments establish toxic exposure pathways, quantify toxicity with respect to adverse health effects associated with exposures and provide reasonable estimates with respect to current and future land-use assumptions. This section summarizes some of the substances for which TCAS has regularly performed toxicological assessments, produced written reports and/or provided expert testimony subsequent to being retained by defendants, plaintiffs, prosecutors, state attorney generals, public defenders' offices and U.S. Attorneys' offices. For purposes of quick reference, hazardous substances can be divided into five basic groups: (1) Environmental Hazards, (2) Industrial Chemicals, (3) Hydrocarbons, (4) Metals & Compounds and (5) Pesticides. Collectively, these groups represent a universe of toxic synthetic and biological agents. As it is impossible to summarize them all within the scope of this website, the table below presents an abbreviated list of some hazardous substances for which TCAS has regularly produced toxicological assessments and provided expert opinions and testimony over a period of more than 28 years. Click on any substance to view the corresponding entry. Montage of public domain thumbnail images: International Association of Fire Chiefs, Woods Hole Oceanographic Institute, et al. Hazardous substance toxicology requires application of scrupulous attention to detail and methodology. Many years of experience are a virtue in conducting such assessments, particularly in cases involving widespread contamination.